Elizabeth Fyfe, We salute you. 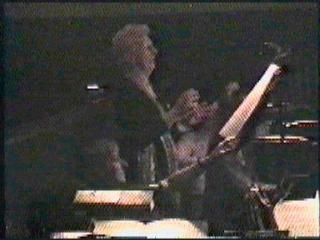 Betty in the Orchestra Pit doing what she loved, conducting. In this, The Smycms Fiftieth year, it is with much sadness that we report on the death of Elizabeth Fyfe, one of the founding members of our Musical company. Betty, as she was affectionately known by all, passed away peacefully in her sleep on Tuesday 3rd September 2013 at the grand old age of 98. Betty Fyfe gave so much to The Smycms, from starting the company along with Colin MacDonald, she involved herself in all aspects of the company, Producer, Musical Director, Committee member, Treasurer and latterly President. In 1963, at the behest of Mr Watt, Minister of St Michael’s Church, Betty was approached to form a Musical Group within the Church, at the time she was a leading member of The Bohemian Opera Company, but jumped at the chance and Smycms was established. From modest beginnings with Swingalong performed in the confines of St Michael’s Church Hall, 10 years later The Smycms arrived at the Church Hill Theatre in Edinburgh for the Edinburgh Premiere of Fiddler On The Roof and with Betty at the helm The Smycms, over the next twenty years, would grow, progress and mature into one of the finest and respected amateur groups in Edinburgh. Why this labor of love? The thrill and enjoyment she found with the Bohemians she wanted to pass on, and her knowledge of the stage had been the stimulus she had given to The Smycms. As Producer and Musical Director she worked tirelessly to put on the best possible shows and the Company responded nobly to her leadership. Sadly, during 1993, Betty was diagnosed with a condition known as Macular Degeneration which results in the gradual loss of vision in the center of the eyes, this prevented her from producing our 1994 show Phil the Fluter but she was still able to continue as Musical Director for another 3 years until Betty herself announced, ” due to my dimming sight this will be my last year as Musical Director” , it was 1997 and Carousel would be her 35th and last show with the company she helped to start , nurture, produce and conduct. Her involvement with the Company would continue with her new role as President of The Smycms. Over the years Betty has imparted her knowledge and professionalism, not to mention unstinting enthusiasm, to literally hundreds of young (and not so young) budding actors and singers. Little did she realise that all those years ago when she was asked to ” put on a concert ” , that The Smycms would give pleasure to thousands, both on stage and in the audience, for many years since. If it wasn’t for Betty’s patience and attention to detail I would never have received a crit in the Evening News describing my singing as” Note Perfect “. Thank You Betty for believing that great things are possible with a little effort and that if its worth doing its worth doing right, though Thank You seems inadequate for a lifetime of selfless devotion to The Smycms. ← He never did get to play Tevye.